Stop Making These Resume Blunders Now! When it comes to application documents, it’s difficult to beat the versatility and diversity of the humble resume. You can mix and match various elements to come up with a resume that suits you the most. If you like to be simple yet precise, then you can go for a text resume. Visual resumes are high engaging and grab the attention of the recruiters instantly but it takes a skill and in-depth understanding to pull it off perfectly. You can also have a go at a hybrid resume (rather popular these days) where both visual and text based elements are used. The freedom to experiment with a resume is simply amazing. But do not take this freedom for granted. There is a fine line between perfection and going over the top while making your pitch to the recruiters. 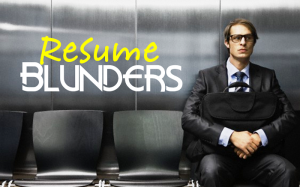 The most common problem associated with resumes is that people tend to follow what has already been done. There is a high probability that you too have copied the format of your resume’s friend. And then there are the so called “experts” who tend to give you their valuable opinion about resume designs. You can always listen to them but think it over before actually implementing it. If you are making the following mistakes, then you need to change your approach ASAP if you wish to pursue your dream career. No matter how much we progress, we still refuse to come out of our comfort zone. In terms of the resume, I am sure all of you are still using the age old ‘declaration’ statement which goes something like, ““I hereby declare that information given above is true and correct…blah blah blah…” First of all, this is a resume, not a legal affidavit so you can stop using such formal representation. And secondly, every recruiter expects you to be honest. Just by providing a declaration, you are not giving irrefutable proof that your statements are absolutely true. So you can DELETE it right now. Moreover, people tend to write their name below this declaration and then leave some space for their signature. Now that sounds understandable. But where is the signature? Yes, people do forget to sign when they have left space for that. If you were a recruiter, would you hire an employee who lacks such attention to detail? If looks could get you a job, then not even a single model would be struggling for employment. Attaching photographs used to be the trend before, but now it only adds to the bulk. Certain professions such as Hospitality, Media, Aviation, Modelling industry consider physical appearance to be a primary factor and attaching photographs when applying in any of these industries, makes sense. But what does an IT job have to do with your looks? You can be shining star or the geekiest nerd in town, you will only land yourself a job if you have the right skills, expertise and mentality. Remove that photograph from your resume ASAP! Mistake #3: Who Said Personal Details Should Be Excluded? The only information that your recruiter is interested in, is the one that is relevant to you (contact information, mailing address, passport information, social / professional profiles, etc). I am still not sure who started this trend of including the details of your age, father’s name, gender, religion, marital status and political affiliation. It seems that you are sending in your matrimonial profile rather than applying for a professional position in an organization. Not only are such details a distraction but they use up valuable space which can be utilized for other requirements. Remember, an ideal resume comprises only 1-2 pages. No one is interested in reading a novel about your achievements and personal information. Take a good look at your objective statement. Is it unique? Does it reflect your actual objectives? Have you conveyed in the slightest manner how your abilities are best suited to fulfilling the requirements of the target organization? If the answer to any of these questions is a “NO”, then you have just joined the thousands of job seekers who somehow have the same career objective. Isn’t it strange? It’s downright stupid. Just because your friend has an objective statement that sounds fancy doesn’t mean that you have to copy it. For your information, there is a good chance that he himself has copied it from someone (the chain simply refuses to end). Using a statement like, “To seek challenging assignment and responsibility, with an opportunity for growth and career advancement…………………” only affirms the perception of the recruiter wherein you are portrayed as having no goal in your life. Use a precise personalized statement where you can mention your competencies and the ways in which you would prove to be a valuable contributor to the organization’s growth and development. It would also be beneficial to quantify your statements. Mistake #5: Formatting? What’s that? If you were given the choice of having food either at a local food outlet or a fine dining, which one would you choose (considering that the cost factor is removed from them)? Of course you would go for fine dining where you get everything presented perfectly, right down to the smallest details. The same applies to resumes. Recruiters don’t want to squeamishly look into the fine lines to identify which information is relevant to which section. Don’t follow any format blindly. Question yourself and find out if the format is one which suits your presentation. It doesn’t matter if you use a simple layout or a carefully crafted resume design, all that matters is that you remain consistent with your chosen style. Research is the key to understanding the current best practices of the industry and to keep abreast with the trends. It will also give you proper insight into the significance of each segment of the resume. However, if you are not able to come up with an effective resume design, then seek professional help. Professional resume writers are not only well versed with various industries, but they keep themselves updated with the latest trends. Moreover, they analyse your abilities and competencies in a way that you would never have been able to do. So in a way, they help you to make the perfect pitch to your recruiters by standing out from the crowd.